On the eve of India’s Independence Day, we bring to you yet another mystical aspect of this great country, this time from the Northeast of India! Delhi Greens Intern Ionebala Hanglem unveils the mystical floating islands that you thought only existed in fairy tales! The Northeast of India is a region full of wonderful destinations: mysterious forests, pristine lakes and peaceful monasteries. One of the most important of these destinations is the Loktak Lake, a sparkling diamond among the pearls. 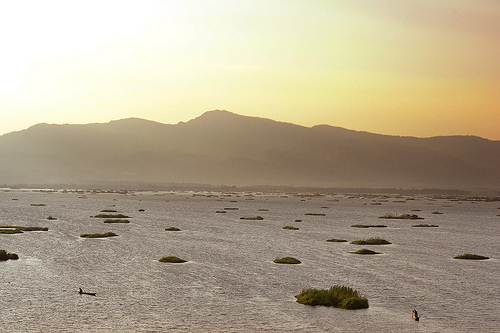 Loktak lake is the largest fresh water lake in Northeast India and is located in the state of Manipur. People of Manipur are culturally, socially and economically linked with Loktak Lake and hence the lake has been referred to as the lifeline of Manipur. A part of the Lake also hosts the Keibul Lamjao National Park, which is the last natural habitat of the endangered Sangai or the Manipur brow antlered deer (Rucervus eldi eldi). The most characteristic feature of the Loktak Lake is the presence of floating islands, which actually float in the lake! Phumdis, as these floatings islands are locally called, they are many in number and variable in size. What’s more, you can even live on these floating islands as people in the state already do! These floating islands are actually heterogeneous mass of soil, vegetation and organic matter at various stages of decomposition. They float on lake water with about one-fifth of thickness above and four-fifth under the water surface. The core of phumdis is composed of detritus which is black in colour and is highly spongy. The fishermen community (Ngameese), who depend on the Loktak Lake for livelihood, actually live on these floating islands — in floating huts called Phumsang. These Phumdis support large congregation of migratory, pelagic and resident fishes which use these floating islands as potential breeding grounds. In fact, the above mentioned Keibul Lamjao National Park is also located on one of the largest floating islands in the Loktak Lake. In doing so, it becomes the world’s only floating island National Park! Phumdis play an important role in the ecological processes and functions of the Loktak Lake. They provide biological sink to key nutrients and govern the water quality and nutrient dynamics of the lake. They harbour several plant species and support a rich biological diversity. Several plant species of economic and ecological importance take part in the formation of Phumdis. Consequently, these floating islands play an important role in the ecological and economic security of Manipur. The plant species constituting Phumdis are used as fodder, food, fuel, for hut construction, fencing and medicinal purpose especially the veterinary medicines and in handicrafts. Fishing in Loktak Lake is accomplished through the age-old method of aggregation and capture on man made (or modified) floating islands called athaphums. The cultural and the traditional aspects of the people of Manipur is not complete without relating to the Loktak Lake and its floating islands. One of the great Manipuri epic of Khamba and Thoibi was written mainly around the Loktak Lake. Presently, a tourist home with an attached cafeteria in the middle of the Loktak Lake is an ideal tourist spot, which gives the visitor an opportunity to stand on a REAL FLOATING ISLAND and also get a bird’s eye view of life along the Loktak Lake itself. Unfortunately however, this very potential natural resource has largely been ignored and the Loktak Lake remains off the radar of the concerned agencies. It is time that Loktak Lake and beauty and mysticism it supports be given due attention, which will not only help enhance the ecosystem services provided by the Lake, it will also add to the economics and development of India as a whole. Ionebala Hanglem is pursuing her M.Sc. in Environmental Studies from the University of Delhi and is a Summer Intern (2013) at Delhi Greens. Her research project at Delhi Greens is focused on the ecology and natural resource management of Loktak Lake in Manipur, India.